The highly dynamic and complex molecular composition of focal adhesions is regulated by a number of physico-chemical signals arising from its surroundings, such as extracellular matrix stiffness, topography, and its biochemical composition. The molecular dynamics within focal adhesions, in turn, regulate their functions in sensing substrate rigidity, forming substrate adhesions, cell spreading and migration. 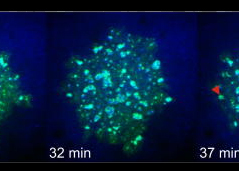 In a recent study, Stutchbury et al used fluorescence-based quantitative techniques like FRAP (fluorescence recovery after photobleaching) and FLAP (fluorescence loss after photoactivation) to characterize the mobility of the core components of focal adhesions. They found that the FA core components differed in their mobility that correlated with their functions within the FAs, allowing them to be grouped into distinct functional modules. For instance, proteins connecting the integrins to the actin cytoskeleton were grouped as ‘structural module’ proteins. This module included talin, vinculin, and tensin, all of which showed very low turnover rates. In fact, their turnover was found to depend on the stiffness of the extracellular matrix, suggesting that these proteins primarily function as mechanosensing components. On the other hand, proteins like FAK and paxillin showed high turnover rates and their mobilities were largely unaffected by extracellular matrix stiffness. This implied that FAK and paxillin do not have mechanosensing functions similar to the structural module components. Instead, they were believed to mediate intracellular signaling pathways within the FAs, and were therefore grouped as ‘signaling module’ proteins. Stutchbury et al also noted that mutating key tyrosine residues in FAK and paxillin or treating cells with FAK inhibitor (inhibits FAK autophosphoryaltion) and/or Src kinase inhibitor (inhibits paxillin phosphorylation) led to significant losses in FA functions such as lamellipodia formation, cell spreading and directional cell migration . This figure illustrates how force (e.g. substrate rigidity, contraction) hypothetically alters the position of molecules and influences subsequent mechanotransduction events (adapted from [16, 17]). A. In the resting state, actin filaments are linked to the ECM through flexible protein linkers (shown as dark pink ovals with a stretchable coil domain). The essential feature of this model is that the signaling components (e.g. Src-family of protein tyrosine phosphatases [SFKs], shown as a yellow circle) move with respect to the linking proteins, which are moving rearward due to actin rearward movement (represented by theyellow arrow in B and C). B. On rigid ECM substrates, the ECM resists unfolding (shown as a thick blue line on the ECM molecule) due the forces of actin rearward movement. Consequently, a quick rise in force near the cell edge is placed onto the linking proteins (shown by the red coil), which causes unfolding and exposure of sites that can be modified (e.g phosphorylated) by the signaling module components near the adhesion. Modifications to the linking module supports additional protein binding and strengthening of adhesions (shown as a light pink oval). C. On soft ECM substrates, the ECM components are unfolded/stretched due to the forces of actin rearward movement. ECM unfolding correlates to a slower rise in force and delayed unfolding of the linking module components until a point further from the cell edge. Because the signal module components remain at the cell edge, they are displaced relative to the adhesion site and are not available to modify the linking module components to promote reinforcement. Substrate rigidity has a great impact on the morphology of certain cell types such as fibroblasts, but has no effect on neutrophils . Rigidity sensing by focal adhesions (FA) can cause changes in FA dynamics and hence propagate signals that alter cell shape and cytoskeletal structures. For example, fibroblast polarization on rigid substrates is preceded by elongation, stabilization and uniform alignment of FAs along the elongation axis of the cell, whereas on compliant surfaces, small rounded and highly dynamic adhesions are formed and no proper polarization is observed . Spacing of matrix ligands is also critical for establishment of stable adhesions. Cavalcanti-Adam et al. have shown that a spacing range of 50-70nm is required between ligand molecules, beyond which adhesions do not form and poor cell migration was observed . This distance seems to coincide with the length of talin, suggesting that talin is the principal mediator of integrin–actin linkage (reviewed in ). Independent of the global ligand density, it has been shown that nanoclustering of at least four integrin-binding sites in this threshold distance range is essential for effective integrin-mediated signaling . Ligand spacing has also been demonstrated to be important for integrin signaling in endothelial cells . Cycling of integrins is a key aspect of mechanotransduction by focal adhesions. Integrins get activated, cluster, segregate and disassemble throughout the different stages of adhesions. This process facilitates both the transition of early complexes to mature and the ability to rapidly disassemble. All these steps are force-sensitive and dependent on other adhesion components (reviewed in ). Recently, it has been proven that integrins rapidly switch between active and inactive conformations within FAs . This influences their trafficking and hence FA dynamics . Adhesion strengthening is required for nascent adhesions to survive shear forces exerted by actin retrograde flow. The friction between the adhesion components and hence the strengthening depends on the nature and organization of the receptor-ECM bonds (reviewed in ), and is known to generally correlate with increasing ligand density  and the ability of integrins to cluster laterally . However, the adhesive bonds for β1 integrins are stronger than that of β3 integrins . In β1 integrins, the adhesive bond is further enhanced by applied forces that increase the catch bond behavior of the molecule , altogether with the engagement of a synergy site in fibronectin . Such catch bond behavior also fits a stochastic model that explains adhesion engagement state in relation to actin retrograde flow and corresponding traction stresses . In β3 integrins, the adhesion strength is increased by linkage to actin  and sustained by force-dependent recruitment of components such as talin, vinculin and paxillin , that reinforce the linkage  and initiate signaling cascades . Adhesion strength can modulate migratory behavior and shape in motile cells . Flow of actin (i.e. actin retrograde flow)- The application of mechanical force that is generated by the actin system seems to be a prerequisite for the earliest stages of focal adhesion assembly and generation of traction forces . 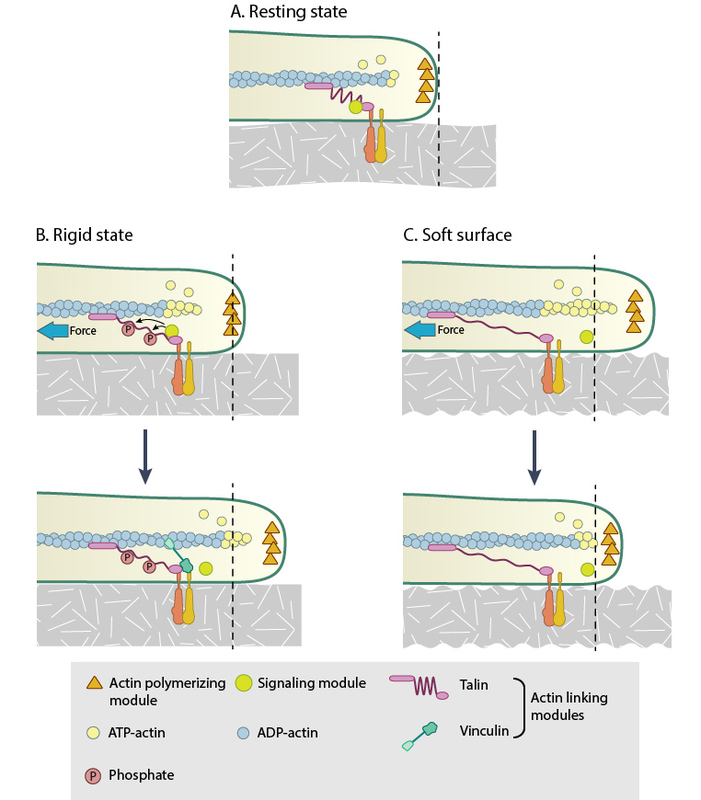 The coupling of the adhesion clutch to moving actin is mediated by the continuous association and dissociation of sliding molecular bonds referred to as ‘stick-slip behavior’ .Quantification of traction stresses exerted on the ECM by FAs using high-resolution traction force microscopy revealed that intermediate actin flow rates correspond to maximal traction . At the leading edge, where FAs form and flow is high, traction is minimal. However near the larger growing adhesion, the flow is slowed down  to ~8-10nm/s and is linearly proportional to traction stress  (reviewed in ). Two stochastic models explain this biphasic relationship of friction at the moving interface between flowing actin and stationary adhesions . The competition between the elastic bonds at the interface and energy dissipation in the viscoelastic actin interior is proposed to modulate the stability of adhesions . The actin-receptor bonds are thought to reach a quasi-equilibrium state between bound and unbound forms. A catch bond model convincingly fits the experimental observations leading to clutch engagement and adhesion growth . These also clarify why traction on the substrate is maximum at intermediate flow . Myosin contractile forces – FA growth, maturation and dynamics are highly dependent on myosin II contractility, that funnels the internal and applied forces to the adhesions as traction forces (, , reviewed in , see video below). MyosinIIA has been implicated in adhesion growth, remodeling of actin filaments into stress fibres and their maintenance between adhesions  while Myosin-IIB is responsible for the formation of FAs at the rear and hence serve to establish cell polarity . However it is to be noted that mature adhesions can withstand about six folds increase in traction stress without any effect on their size . During cell spreading, myosin contraction gets activated at early stages at the end of initial rapid spreading phase, when the cell transforms to a flat morphology, due to the physical barrier posed by the plasma membrane . Thus increase in membrane tension seems to get converted into biochemical signal that activates actin assembly in the protruded area and causes local contraction that favors adhesion assembly . In an independent in vitro study, Yu et al. have shown that upon early actin polymerization from liganded integrin clusters, myosin II contraction of clusters activates protrusion with the actin providing outward forces and the myosin providing the local contraction and inward movement . This cyclic process known as the periodic lamellipodial contraction is mediated by myosin light chain kinase (MLCK) and the forces aid adhesion assembly and complete cell spreading . Hence, one cannot ignore the possibility that the two mechanisms could be interconnected.